Marlene descends from Thirza Ann Yeo from Swimbridge. Thirza's parents were Henry Yeo and Elizabeth Aurther. Unlike the rest of the family they emigrated to Canada. 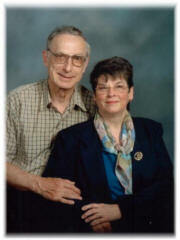 Attached is a photo of Marlene and her husband. She also has her own web page that has a little of her Yeo family history and some fantastic old photographs and other family treasures. Many thanks to Marlene for sending me this photograph. 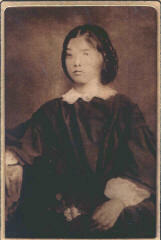 On the left a photograph of Elizabeth Aurther who married Henry Yeo and on the right is Thirzia daughter of Henry and Elizabeth. Hi Sheila, I have some details for you on Jane Authers Yeo's family. You already have her husband Arron.The following list is their children; Mabel born 1870. Ernest " 1872 Caroline " 1874 Arthur " 1876 Rossana " 1877 Robert Overton " 1878 Jane E " 1880 I am sure there is more info I can find for you.I will send you a PAF file when I teach myself how to use it.Is a scanner the best way to obtain a electronic copy of an old photo?I am sorry I don't have any info on Jane.I wish I did! In fact no one in my family knew who she was.The photo of her was written on by my grandfather years ago , without a name(only stated that this was his grandmother).The daughter Caroline somehow came to be living in the Riverdale area of Toronto.My Ggrandfather John Franklin Smith originaly married a Nancy Ann Snodden.They had one child Veda (born 1887) approx 2 years later Nancy Ann Died. One day sometime later,(date unknown) John Franklin was walking baby Veda in Riverdale Park, and Caroline Stephens who was working as a nanny was also walking someone elses baby, they met in the park and started talking .The rest they say is history.They married Sept 20,1893 and had nine children of their own.Thats 10 counting Veda. Any thoughts or info how Carrie (no one called her Caroline) came to be in the area? Well thats all for now.Talk again soon. Best Regards ,Bob.